Margaritas are pretty tasty (if you’re using worthwhile tequila and avoiding that strange, premixed nonsense, at any rate), and call for orange liqueur as a primary ingredient. We’ve got Cointreau, Grand Marnier, and some tequila, so let’s do a science! The primary question is whether varying the orange liqueur in a margarita will make a difference, and, if so, which liqueur is preferred by our panel of Alcohol Science Enthusiasts. Secondarily, the recipe we’re using calls for adding sugar to the drink. Will using simple syrup instead of granulated sugar make a difference? As we’ve documented before, Grand Marnier and Cointreau have noticeably different characters. We expect that difference will be apparent in the finished drinks. During an earlier attempt at this particular recipe, we noticed that the sugar used in the drink does not dissolve completely. We expect that the use of simple syrup will result in a sweeter drink overall. There’s also a need for a cocktail shaker, measuring gear, suitable cocktail glasses, and, of course, persons willing to drink margaritas For Science! 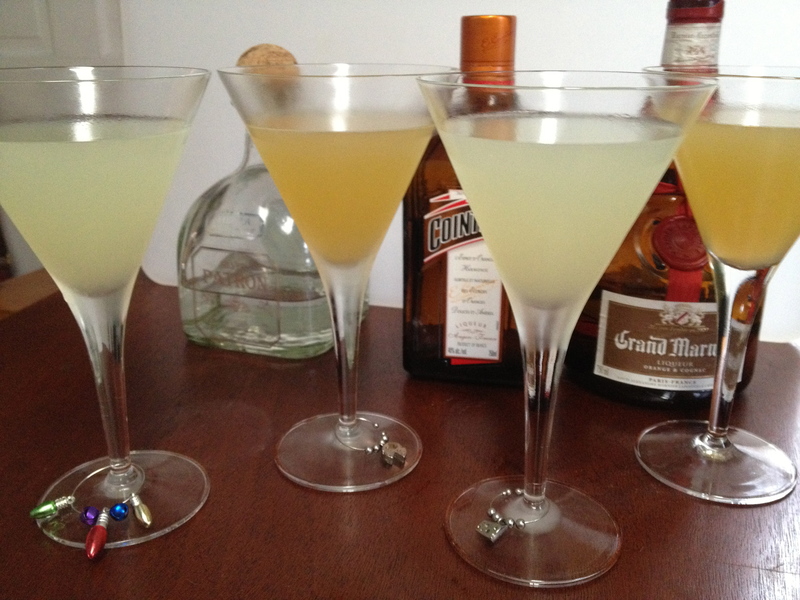 We’re using the 12 Bottle Bar margarita recipe, more or less. From left to right: Cointreau and sugar, Grand Marnier and sugar, Cointreau and simple syrup, Grand Marnier and simple syrup. Both sugar trials left some residual sugar in the measuring gear and shaker. Adding tequila to a vessel with said residual sugar results in the sugar swirling around, leading to comments like “it looks like a snow globe in there”. We also observed that the cap on a bottle of Grand Marnier can be bitey, and appears fond of eating sleeves. First and foremost, all four margaritas were found to be generally unobjectionable, and significantly better than past experiences with ‘ritas based on bottled mix and/or Jose Cuervo. On the whole, the Cointreau-bearing drinks were preferred to the Grand Marnier versions, with the Cointreau/sugar model especially favored. Taster B opined that, while he preferred Cointreau/sugar, the Grand Marnier/sugar version seems to best fit the classic mixed drink profile, with strongly assertive, but reasonably well-balanced, flavors. Taster K observed that the Grand Marnier seemed to accentuate the overall tequila-ness of the drinks. General consensus also held that the sugar-bearing models had more pronounced citrus/bitter flavors. Once again, Cointreau was preferred to Grand Marnier in taste tests (that’s 3 for 3, for those playing along at home), though neither was considered bad. The use of sugar, as called for by the recipe, was also preferred to using simple sugar. The recipe we started from actually calls for Gran Torres as its orange liqueur of choice, rather than Cointreau or Grand Marnier. While this is not currently available for testing, it would be interesting to try a margarita prepared with the specified liqueur. The fact that not all of the sugar dissolves in the drinks also leads us to believe that a 1-to-1 substitution for simple syrup may not be entirely appropriate, and could do with additional calibration. Finally, having observed that lemon juice source affects flavor, it might be worth testing margaritas made with fresh squeezed or key lime juice, in place of ReaLime. I think a lot of people use Triple Sec for the orange liquer source for theiir margaritas, and I suspect more people have it on hand than the two your tried out? It might be nice to compare that cheaper, more accessible liquer next time. Love your posts and the spirit of curiosity! You have inspired us to begin a project: when either of us order 2 beers and do not specify to whom they go, does the server put the lighter beers in front of my wife and the darker beers in front of me, and is it affected by which of us orders and server gender? Sample size 2 so far, but we plan to do much research in the next few weeks!